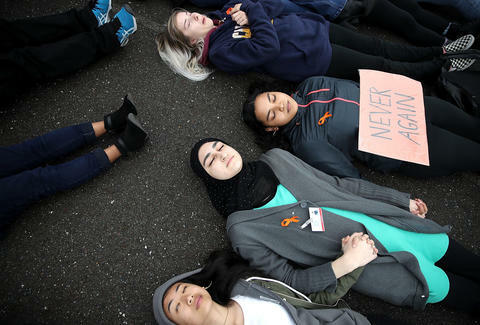 The survivors of last month’s deadly shooting in Parkland, Florida -- with the help of gun control advocacy group Everytown for Gun Safety -- are organizing the March for Our Lives demonstration in Washington, DC, with sister marches popping up worldwide. March for Our Lives Boston is expecting more than 60,000 people, with more than 53,000 who marked interested on Facebook as of publication time and over $29,000 already made in donations. As part of the mission statement, the survivors say on the March for Our Lives official website, “On March 24, the kids and families of March for Our Lives will take to the streets of Washington, DC to demand that their lives and safety become a priority.” Here’s everything you need to know about Boston’s demonstration on Saturday. The March leaves from Madison Park Technical Vocational High School (75 Malcolm X Boulevard, Roxbury, Massachusetts, 02120) and heads to Boston Common. Arrival time is between 9-10am, and the march steps off at 11am. An official rally will also start at Boston Common at 2pm. The march from Madison Park High School to Boston Common is about 2 miles long, routed down Columbus Avenue. The march will end on Charles Street in the Boston Common. If you’re using public transportation, get yourself a CharlieCard and take either the MBTA Orange Line to Roxbury Crossing or MBTA buses 66/45/15/28/23/19 to bus stop Malcolm X Boulevard @ Madison Park HS. You can check MBTA schedules, maps, and service updates at the MBTA site. Ride-share company Lyft is providing free rides to the march, but be aware of potential traffic due to street closures and a higher demand for drivers resulting in longer wait times. Busses carrying groups will drop off at the Madison Park Technical Vocational High School and pick up at the corner of Charles and Beacon between 4:30-5pm. What should I wear for the weather? It’s going to be chilly so bundle up with layers. Wear a comfortable pair of shoes with warm socks, a hat, and gloves. Although you will be moving, you are still going to be outside for most of the day, and we all know this March (the month) has been brutal. Where should I go out to eat after? The Boston Common area is filled with restaurants. If you’re in a need of a quick pick up, there are coffee shops and places to pop in sprinkled on the outskirts of the park. If you’re looking to sit down, rest, and grab a bite with some friends after the march, there are plenty of nearby options. For a quick bite on the go and a cup of something warm, stop into the Thinking Cup. There are two locations within walking distance of the Boston Common. This down-to-earth coffeehouse has sandwiches, pastries, and a large selection of coffees and teas. It's probably a good place to use the restroom, too. Located two blocks away from the stopping point is the 80-year-old Beacon Hill institution, The Paramount. This long-standing family favorite is known for its excellent, fairly-priced American home cooking -- particularly the breakfast. The restaurant tends to have long lines on a normal day, so be prepared for a wait due to the influx of demonstrators in the area. For beers and fried pickles, stop into JM Curley. Just a few steps from the Boston Common, this pub has a killer brunch menu, unique and delicious cocktails, and snacks to share with a group. Also, the duck poutine is terrific. How else can I get involved in the cause? Before: You can make a donation to March for Our Lives Boston here, and text “LIVES” to 64433 to sign the March for Our Lives Everytown Petition. During: Specifically, the March for Our Lives Boston are in need of large numbers of marshalls, medics, and legal observers. They are looking for trained volunteers to help manage crowds and keep marchers safe. If you’re interested in signing up to volunteer in any capacity, you can fill out the form on their volunteer hub. 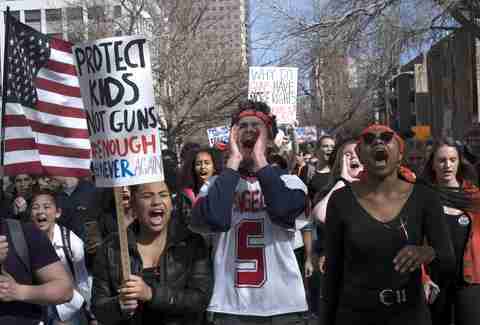 During the March, you can shout out the March for Our Lives Boston demonstration on all social platforms and using the hashtag #MarchforourLivesBoston. You can also tag the mother march with #marchforourlivesdc. After: Check out the March for Our Lives Boston website, where you can register to vote, sign up as an endorser, and make a donation. You can also volunteer with or donate to established gun control organizations, including Everytown for Gun Safety, Moms Demand Action for Gun Sense in America, The Brady Campaign, and the Coalition to Stop Gun Violence. After the Las Vegas shooting that killed 58 people, Massachusetts was the first state in the US to ban bump stocks, and the state has strict gun laws but there is still work to be done. If you live in the state, you can contact your representatives and urge them to support two bills that would impact the state’s gun control, the Extreme Risk Protective Orders (ERPO), and the State Full Assault Weapon Ban (H.R. 5087). What if I'm out of town? 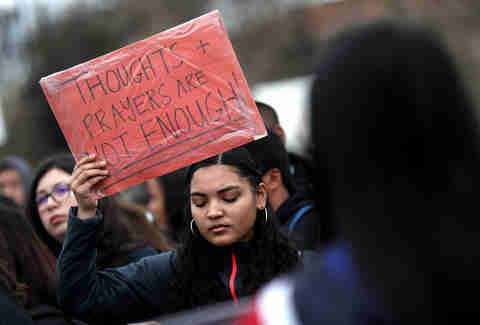 There’s over 800 March for Our Lives events worldwide, you can look up your city here. We've published guides to the March for Our Lives events in DC, LA, Chicago, NYC, Miami, and San Francisco. Read any of them if you plan on traveling to those cities and want to check out the marches this weekend.